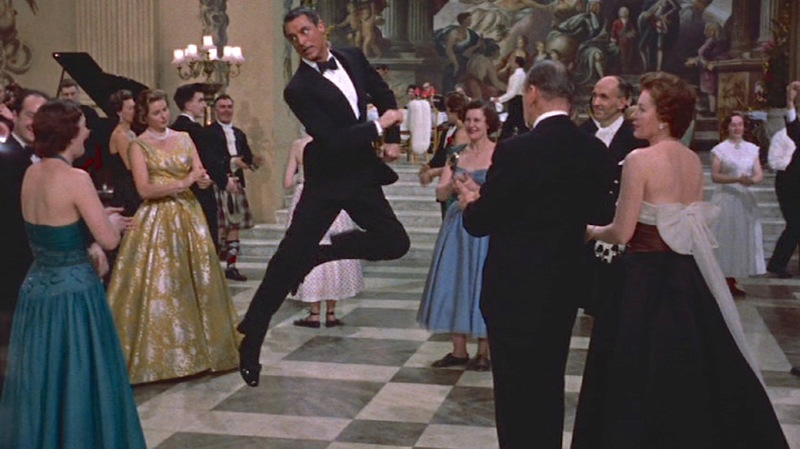 Between 1955 and 1962, Grant starred in seven contemporary-set films that didn’t require him to be in military uniform; of these, he sported a tuxedo in all but one (the lone exception, North by Northwest, featured the actor wearing arguably the most famous suit in movie history so there was little need for black tie.) 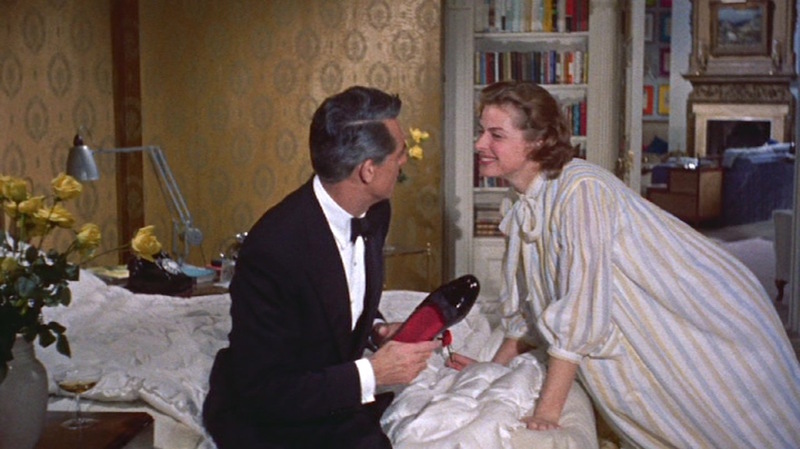 In the middle of this impressive and stylish run of movies is Indiscreet, a Stanley Donen-directed romantic comedy that earned Grant his first of five Golden Globe nominations. Indiscreet reunites Grant with Ingrid Bergman, with whom he had shared remarkable chemistry—and a rather famous kiss—in Hitchcock’s 1946 thriller Notorious. Bergman plays Anna Kalman, a successful London-based actress whose life has been lucky in all but love. After a string of boring men, she meets the charming, interesting, and seemingly eligible economist Philip Adams (Grant) who would be her perfect match except for one small detail… he tells her that he’s married. Despite his confession of marriage, Anna pursues a date with Philip with the unspoken understanding that it will be the beginning of an affair. Philip arrives at her flat the following Saturday evening to pick her up before the ballet. The conversation is stilted—particularly when considering each’s intentions for the other—with topics ranging from dinner reservations to climate change before Anna is swarmed by autograph-seekers on the way to dinner at The Players Club. Of course, their legitimately engaging conversation over dinner results in the couple so immersed in each other that they’re late for the ballet. Surrendering their tickets to a young couple, Philip and Anna find themselves aimlessly wandering the streets of London, sharing their first kiss by the Thames. By now, the affair is inevitable and it’s only a matter of time before Anna’s heart is broken by a married man who refuses to leave his wife… or is it? Months later, Philip breaks the news to Anna that his NATO job is summoning him to New York for 3-5 months. She is devastated, but luckily the two have plans for a party that evening with friends at the Royal Naval College’s annual Spring Dance at The Painted Hall, where they spent their first evening together. By the time they’re sitting down to dinner, a spiteful Anna knows the truth that Philip isn’t married and that he merely pretends to be so that he can end his various romantic entanglements before women begin talking to him about marriage. 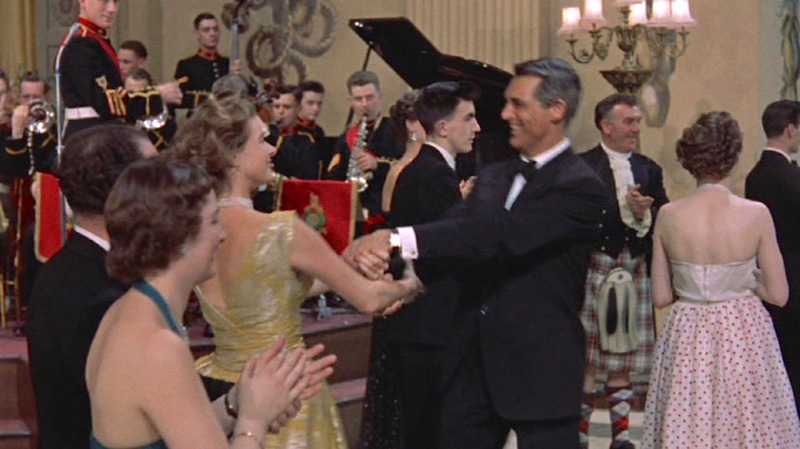 A famous scene finds Philip obliviously mugging his way through dancing a Scottish reel, unaware that Anna is fuming mad and awfully fed up with him and his antics, though it gives the erstwhile Archie Leach an opportunity to show off the dancing expertise he learned early in his career. Anna keeps the ruse going after dinner when Philip returns for a nightcap, torturing him—and his pride—with dreamy talks about an ex-suitor named David who has returned his attention to her. 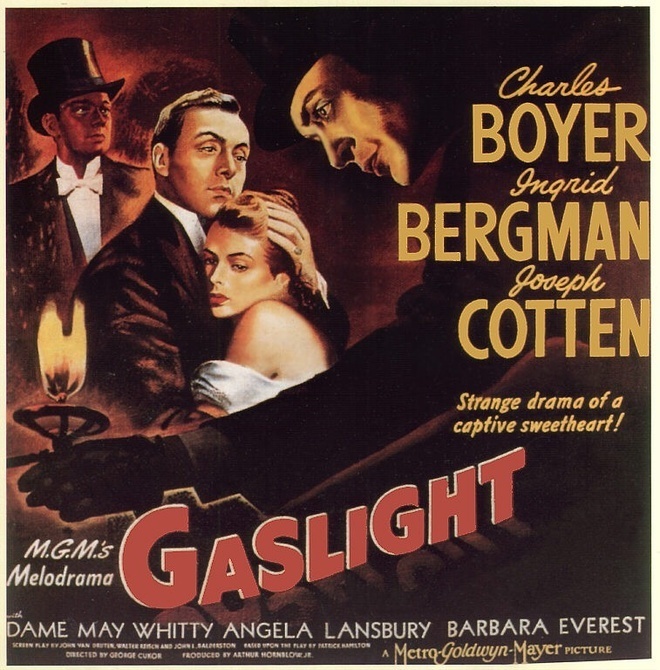 It’s nice to see Ingrid Bergman get to emotionally manipulate someone else for a change! Philip: For an evening that started out well, this has turned into one of the most exasperating evenings of my whole life. 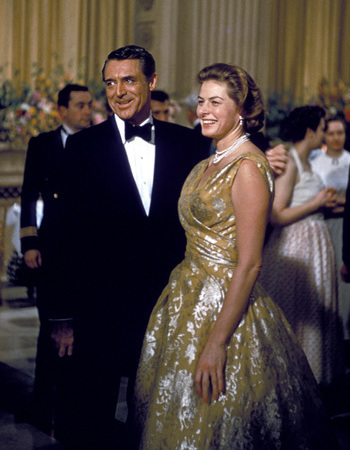 Both Cary Grant and Ingrid Bergman were immaculately dressed in Indiscreet, Bergman outfitted by Christian Dior while Grant was tailored by Quintino, the Beverly Hills tailor also credited with making his iconic suit in the following year’s North by Northwest. Indiscreet showcases a parade of elegant tailoring from Grant’s business suits to a full white tie kit. 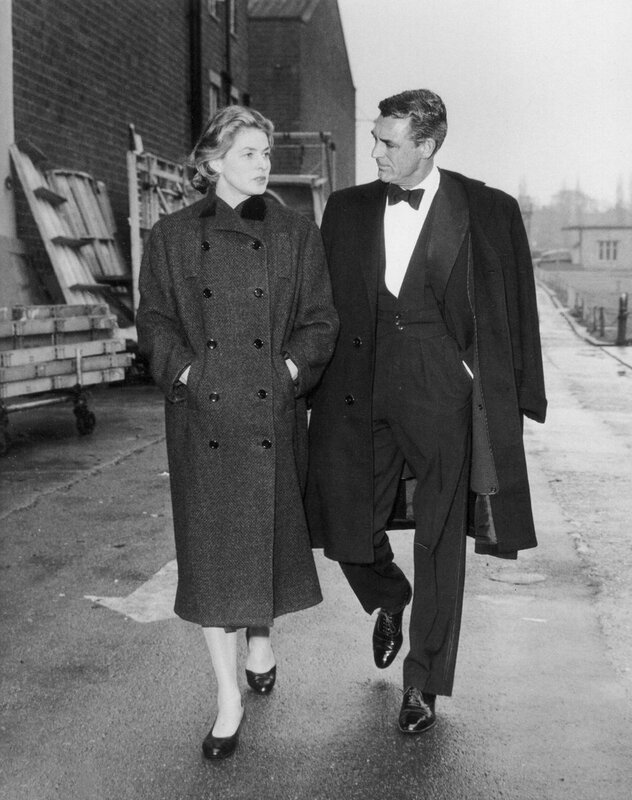 The pièce de résistance of Grant’s wardrobe as Philip Adams is arguably the sharp three-piece dinner suit in dark midnight blue wool that makes several appearances during Philip’s various romantic outings with Anna. This tuxedo echoes his formal wear in the previous year’s An Affair to Remember, though this single-breasted dinner jacket has a traditional single-button closure rather than the link-button closure on his jacket in An Affair to Remember. The single front button and the four cuff buttons on his Indiscreet dinner jacket are all black plastic sew-through buttons rather than the silk-covered kind often found on formal wear. Philip and Anna’s first date begins with an awkward—but stylish—elevator ride. 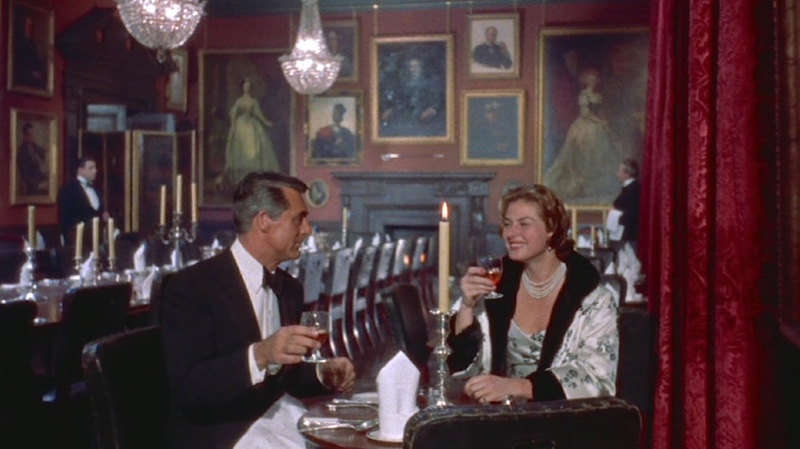 Grant had worn a similar dinner jacket during his last collaboration with Ingrid Bergman, Hitchcock’s 1946 spy thriller Notorious, so it’s possible that he may have just nostalgically repurposed the jacket for his reunion with her a dozen years later in Indiscreet. In addition to the details of the black plastic sew-through buttons, both dinner jackets share their cut with a full chest and straight shoulders. Perhaps the most compelling argument that it’s the same jacket is the width of the broad, satin-faced peak lapels with their slanted gorges. These lapels would have been more fashionable at the time Notorious was filmed and set in the mid-1940s and they look somewhat—but only somewhat—out of place on a dinner suit in the late ’50s. 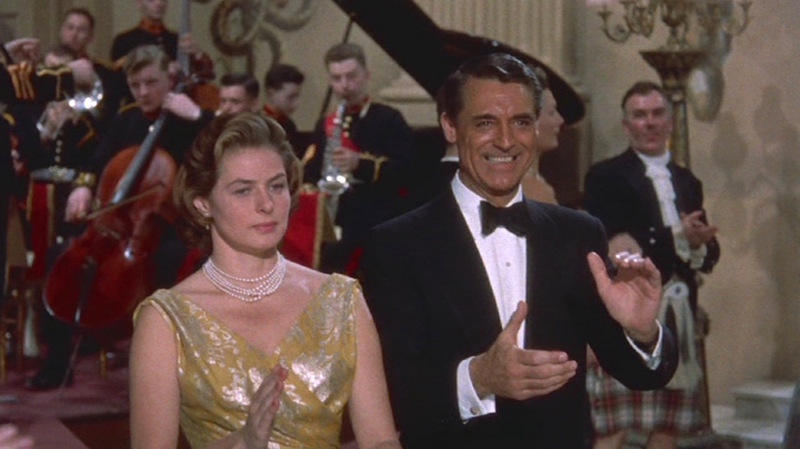 …shades of a similar black tie ensemble he wore 12 years earlier in Notorious (1946), also starring Ingrid Bergman. Ingrid Bergman and Cary Grant on the set of Indiscreet (1958). The dinner suit appears to be the same, though Grant wears cap-toe oxfords rather than the opera pumps he wears in-character. 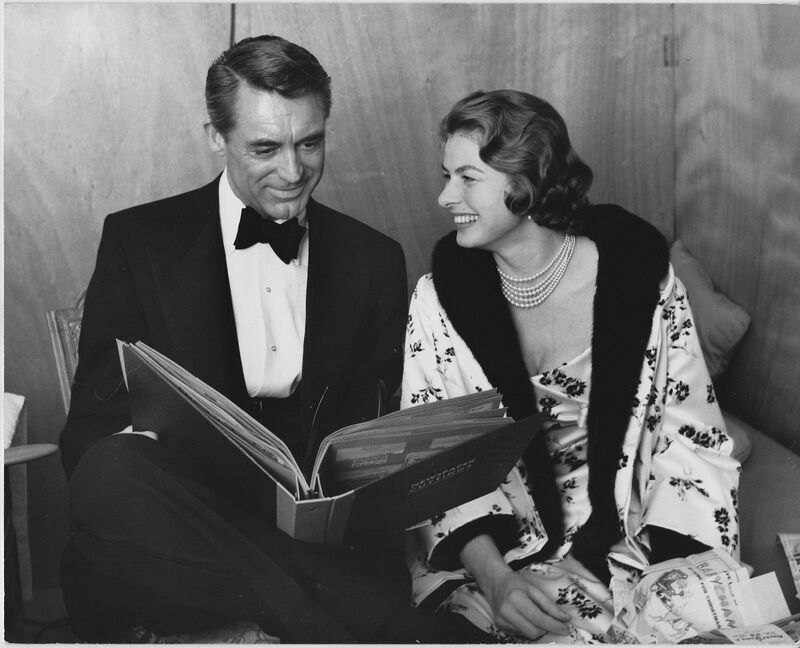 Particularly interesting when considering the jacket’s lineage, BAMF Style reader “Wolf” commented on the post about his tuxedo in An Affair to Remember that Cary Grant may have worn the Notorious dinner jacket as early as 1940 when attending the premiere of The Philadelphia Story. 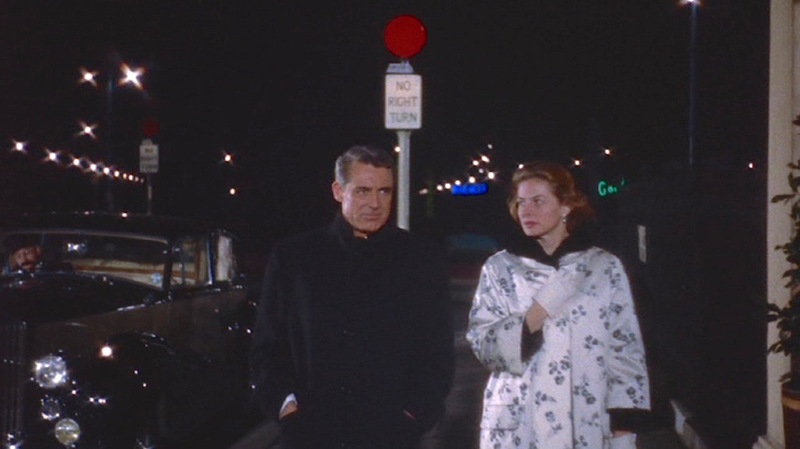 It seems hardly likely that Cary Grant—of all people—would wear a dinner jacket that was pushing 20 years old in one of his films, but that could be a testament to the quality of tailoring. Would Grant have been wearing Quintino-tailored garments as early as the 1940s? 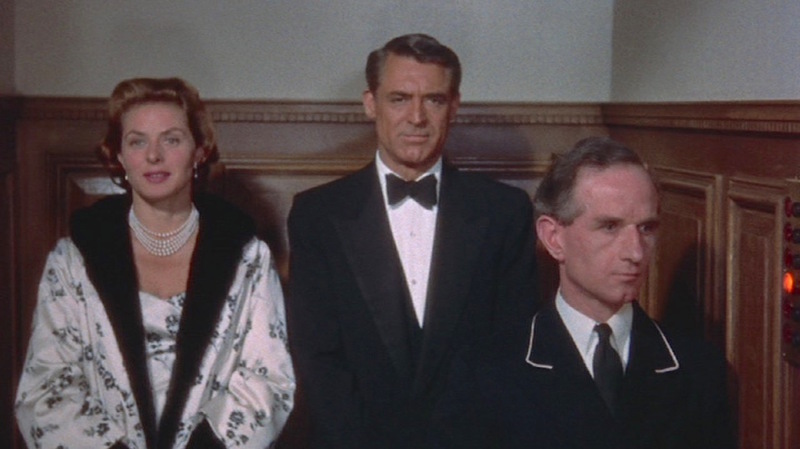 Given that Indiscreet’s opening credits so proudly tout “Cary Grant’s clothes by Quintino”, the dinner suit that he wears for significant portions of the film and the majority of its promotional artwork would undoubtedly have been made by Quintino. 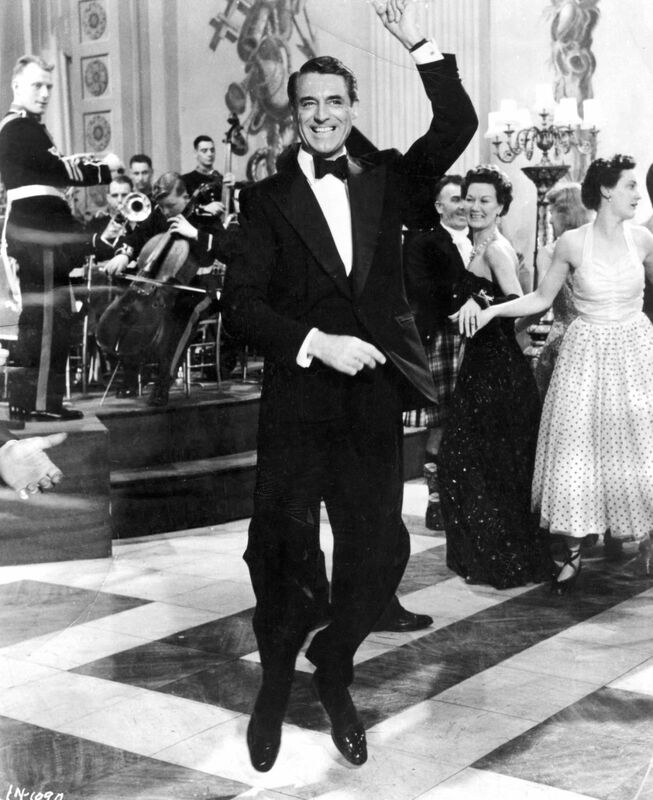 Cary Grant was known to favor wearing a waistcoat with his dinner suits rather than a cummerbund. Here, he sports a single-breasted waistcoat with a wide-bellied “dog ear” shawl collar, welted pockets, and three very closely spaced buttons. The shirt has a plain marcella bib front that takes two visible diamond shirt studs, and he wears a set of round mother-of-pearl cuff links in the shirt’s double (French) cuffs. Philip enthusiastically claps along during the Spring Dance. Anna… not quite as enthusiastic. A large black silk butterfly-shaped bow tie harmonizes with the wide silk-faced lapels. A smaller bow tie tends to make one’s head look bigger—an issue where Grant was famously self-conscious—so it makes sense that he would opt for larger bow ties. Philip wears double forward-pleated formal trousers that match the midnight blue wool of the dinner jacket with a thin double silk braid down each side. The waistband of the trousers is never seen as Grant never removes his dinner jacket on screen, but they like have buckle-tab side adjusters to fit around the waist. The bottoms are plain-hemmed per formalwear tradition. 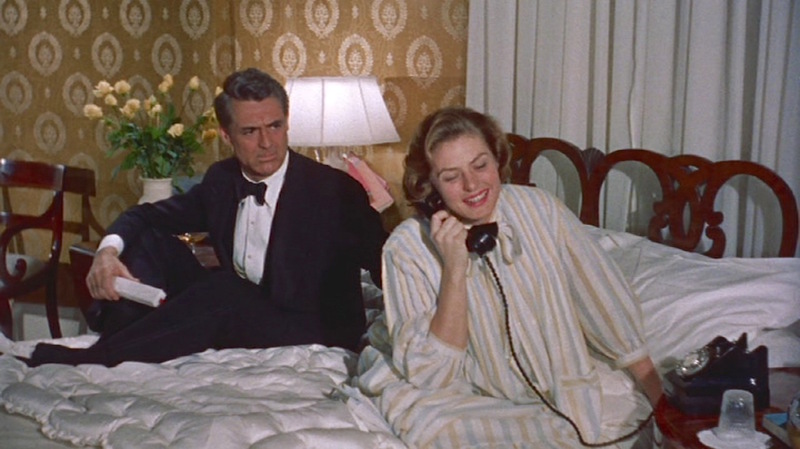 Philip is none too pleased with Anna receiving late evening calls, purportedly from a rival for her affections. Decades later, Alan Flusser remarked in Dressing the Man that, “as a vestige of male court dress, the opera pump remains the sole item of men’s fashion to enter the twenty-first century pretty much as it left the nineteenth.” The pumps that Grant wears in Indiscreet are black patent leather—the most formal and correct material—with black ribbed grosgrain silk bows and red silk lining. He wears them with dress socks made of thin black silk. Philip makes a point of his elegant sartorialism by keeping his patent leather pumps in hand while gesticulating around Anna’s room. Philip Adams wears a gold watch with a white rectangular dial on a black leather strap, possibly the Cartier Tank that Grant wore in real life. Louis Cartier took inspiration from the Renault tanks that rolled through the Western front when designing this innovative timepiece that helped popularize wristwatches when they entered mass production after World War I. Over a century of production, these watches have been appropriately associated with some of the most elegant style icons including Clark Gable, Jacqueline Kennedy, Yves St. Laurent, Rudolph Valentino, Princess Diana, and—of course—Cary Grant. During the awkward conversation that precedes their first date to the ballet, both Philip and Anna comment on the unseasonably muggy weather. However, the passing hours herald a chill in the November air, and Philip finds himself wearing the black wool knee-length Chesterfield that he was carrying. He buttons all three of the single-breasted coat’s buttons and even fastening a fourth button at the neck, closing the coat over his chest for additional warmth. The weather may have decreased in temperature, but the passion between Philip and Anna increased over the course of their date. The coat also has hand pockets, cuffed sleeves with no buttons, and a long single vent. On their first real date, Philip and Anna both order Scotch and soda at The Players Club. One of the simplest drinks, with its ingredients limited to Scotch whisky and carbonated soda water, the Scotch highball emerged as a particular favorite of the Mauve Decade and remained in vogue through the first half of the 20th century before it was supplanted by more “interesting” drinks during the resurgence of cocktail culture in the ’50s and ’60s. 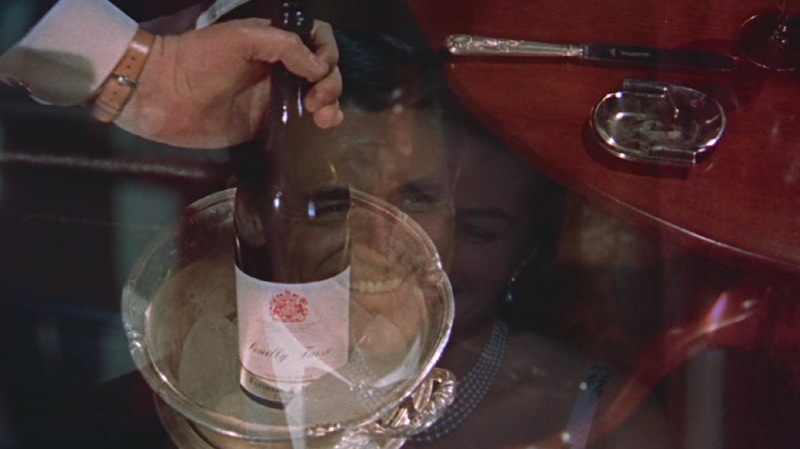 Scotch and soda carries particular significance throughout Indiscreet, as Anna had previously complained that they were only two of a dozen words spoken by her previous paramour, a banal “Greek statue” of a colonel. However, she was more than happy to mix some Johnnie Walker Red Label with soda water during her and Philip’s first evening together earlier that week, and she herself orders a Scotch and soda with him at The Players Club. The Players Club evidently chooses not to serve highballs in traditional highball glasses. Dinner at The Players Club is accompanied by a few bottles of Pouilly-Fuissé, a dry Mâconnais white wine. The Pouilly-Fuissé village appellation was instituted in 1936, taking in the four villages of Solutré-Pouilly, Fuissé, Vergisson, and Chaintré. The passage of time is marked during Philip and Anna’s date as the waiter removes one bottle of Pouilly-Fuissé to replace it with another. Any oenophiles able to ID the bottle? 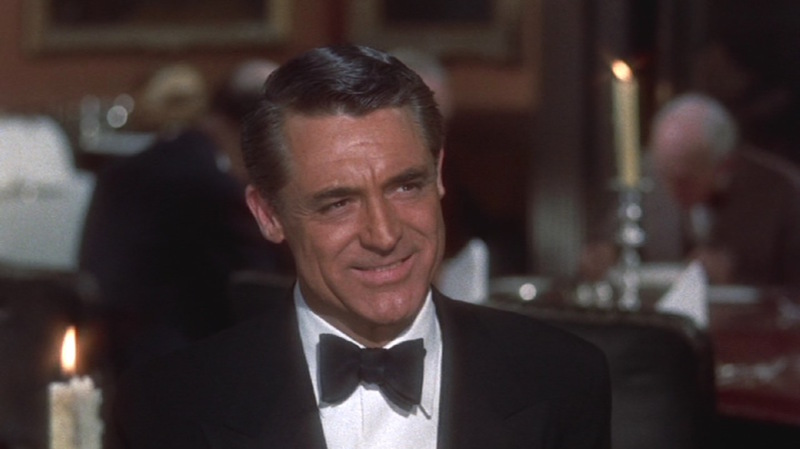 Once one has accepted the fact that it’s not very possible to match Cary Grant’s level of elegance when wearing a tuxedo, feel free to take inspiration from his sartorial wisdom. Grant’s venerated place as a style icon is no accident: he had access to fine tailoring (in this case, Quintino), he was aware of what was most specifically flattering to his physique and looks, and he respected the traditions of men’s formalwear without being afraid to make his own mark. I don’t consider myself a snob, but I’m sure there are no one among my acquaintances who follow women to powder rooms! The film is a delight, have watched it twice in the past year.